There are many ways that you can make a valuable contribution to this study and for the benefit of future gastric cancer treatment trials. Please click on the appropriate link below to find out more. For an overview of the planned process for standardising gastric cancer trial outcome reporting, please click here. As a patient, your voice and opinion is vital to the success of this study. One of the stand-out characteristics of this project is that it aims to inform future research trials how to report their results in a way that is relevant to patients as well as the clinicians treating them. 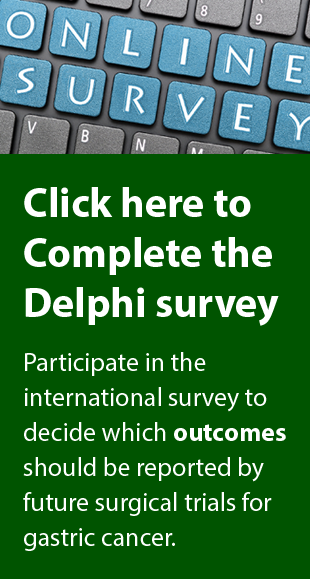 International Delphi Survey: During 2019, we will be organising 2 rounds of surveys to decide which outcomes research trials will be advised to report – known as the Core Outcome Set. During each round, doctors, specialist cancer nurses and, importantly, patients will be asked to decide which are the most important outcomes to include. The most important outcomes to patients, surgeons and nurses will be kept in the Core Outcome Set. The surveys will be available online. If you would like to take part, please register your interest by filling out the form in the column on the right hand side of this page. During 2019, we will be organising 2 rounds of surveys to decide which outcomes research trials will be advised to report – known as the Core Outcome Set. During each round, surgeons, specialist cancer nurses and, patients will be asked to decide which are the most important outcomes to include. The most important outcomes to patients, surgeons and nurses will be kept in the Core Outcome Set. The surveys will be available online. If you would like to take part, please register your interest by filling out the form in the column on the right hand side of this page. Surgeons naturally take the lead in pushing the research boundaries within their speciality. However, a Core Outcome Set for gastric cancer surgery trials can only be successful if it is adopted by surgeons. It is vital they are involved in shaping a Core Outcome Set during the consensus process.